If you are looking for the best die grinder for your needs, you have definitely come to the right place. Die grinders are considered to be state of the art powerful tools that can serve a wide range of purposes. They include grinding, sanding, honing, and even polishing. Before purchasing, it is important to understand the details concerning a die grinder in order to make an informed decision. This is regardless of whether you need it for home or professional use. There is a ton of information on the Internet on different brands that are manufacturing these tools and we understand that this can be quite overwhelming.This is why we have taken the time to review the 5 best die grinders just for you. In addition, we will be looking into what to consider when purchasing the tool and lastly, we will provide a final verdict on the die grinder that is best suited for your needs. This is a powerful tool manufactured by Ingersoll Rand. It is known to be one of the best air grinders because of its reliability, durability and performance. There is no question about that considering the company has been around for over 100 years. The design and shape of this die grinder is a wonderful feature as it allows the user smooth operation. The spindle is positioned at the angle convenient for handling different work spots and surfaces. In addition, it enables the craftsman to reach the tightest of spots with ease. This Ingersoll Rand die grinder has an aluminium housing which is great because the craftsman can use it to perform tough operations, even in rugged job sites. Therefore, you have nothing to worry about with this tool as it assures you the ability to withstand challenging conditions. The motor has been made to run at 21,000 RPM (revolutions per minute), which delivers ¼ or 0.25HP (horsepower). I really appreciate this feature considering I can use it for buffing wood and metal without worrying about damaging the tool. Another feature that this tool, is popular for is the ball bearings. The manufacturers have designed it in such a way that the vibrations are reduced, thus making it a well-balanced power tool and gives it the ability to last longer. This is a great tool for all those who have smaller hands and would like to get into those tight corners. When you think of this tool, think about great quality at an affordable price. That is definitely a good combination. 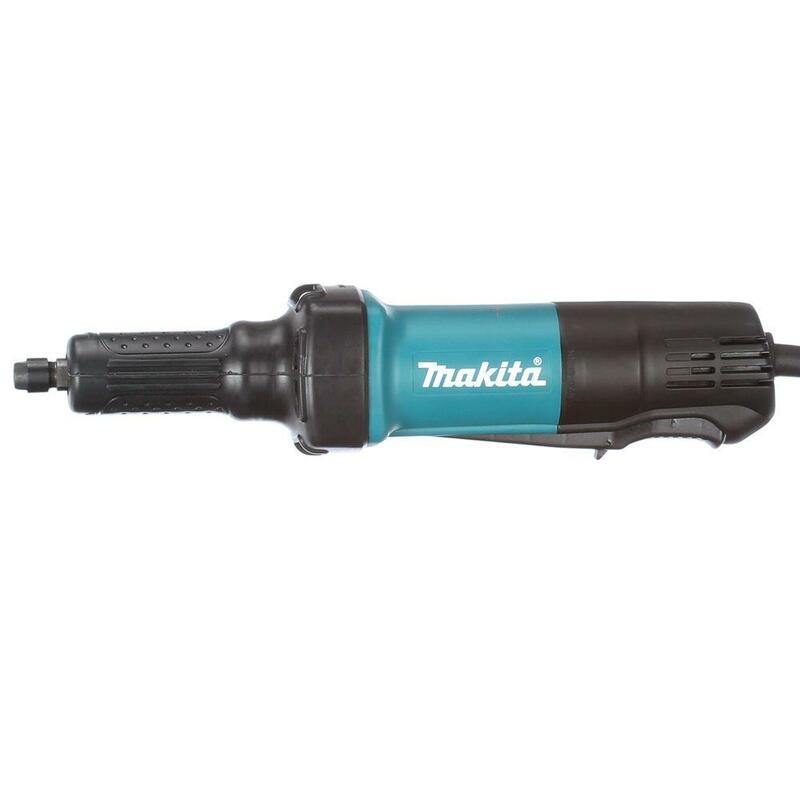 This is a great product from one of the best brands, Makita. This brand is known to apply outstanding innovation to make power tools that are energy efficient, and can still deliver on industrial strength and power. A great feature that is widely recognized with this tool is that the armature coil is sealed from the dirt with a protective zigzag varnish. This, in turn, creates a barrier when the tool spins thus preventing dust or any other debris from getting in. This die grinder boasts of having high heat resistance with vent slots which are made to push out the exhaust gases away from the user. Also, this feature ensures that the tool lasts for longer. The AC/DC switch is one of my favorite features because it means the die grinder can be used with alternative power sources. Keep in mind that this depends on the task at hand and the location of the person who intends to use it. If you are interested in an extremely powerful motor housed in a relatively light tool, this is the die grinder for you. It may not give you the best control compared to other models, but it sure does get the job done. This is a powerful pneumatic tool that comes from one of the leading brands in the USA, Chicago Pneumatic. It is quite popular in the market because of its compact nature and maneuverability. So why should you get your hands on this die grinder? Let us look at the features to answer this. This tool boasts of having a 90◦ angle head. This is good because it allows the user to access the tight quarters or spaces while working with it. With this pneumatic die grinder, you need not worry about the tight spaces. Another great feature about this tool is that it weighs 1.1 pounds. This means that you do not have to be bothered about fatigue during and after use. This die grinder credits itself for having high heat resistance with vent slots. This is great as it ensures the harmful exhaust gases are pushed away from craftsman working with the tool. As if that is not enough, this feature also contributes to the durability of the die grinder. What is most appreciative about this pneumatic die grinder is that not only is it light, but it is also less noisy during operation. Also, it works pretty fast and gets your work done in no time. The engineers at Dewalt have come up with a powerful pneumatic die grinder that is best for home use. It is known for its great design which enhances its comfortability and durability. A feature that this tool is popular for is its well-designed cushion grip. This is because, during tough operations, the craftsman can enjoy the comfortability that comes with it. Also, the parts are housed in an aluminium casing which means that it can withstand harsh environments. This definitely makes it worth a purchase. This air dies grinder has been manufactured with a great safety feature. This is the touch control trigger which has a self-locking mechanism. This means that the trigger can be pushed only when the lock is down, thus enhancing your safety when using it. Another great safety feature that the tool boasts of having is the safety throttle lever. This, in turn, prevents the craftsman from inadvertently switching the tool one which may cause a major or minor accident. If you are on the lookout for a die grinder with a robust performance, quality design, and long service life, the Dewalt DWMT70783 Straight Die Grinder is just the tool for you. As mentioned earlier, the manufacturers of this air die grinder have been in the industry for over 100 years. This shows that they have mastered the art of creating products that are powerful and of good quality. With this feature, it ensures that the craftsman can make faster abrasive changeovers without putting too much effort. This die grinder has been created in such a way that it has a low profile throttle lever and an enhanced ergonomic grip design. This is to allow for comfortability, as well as preventing user fatigue during operations. Another great feature that the manufacturers ensured was the ball bearing construction with an ergonomic and durable composite design. What this design tends to do is to ensure the tool has a long life. For a great combination of power and comfort, this is the air die grinder just for you. Considering the company has been around for a while, you can be sure that their tools live up to standard. Also, this model not only has a pneumatic line, but also a cordless line. This clearly leaves you spoilt for choice. Before purchasing a die grinder, it is of utmost importance to take a few aspects into consideration. Price is not the only factor to think about. Once you know what kind of job or purpose you need for a die grinder, then you can proceed to look into the following aspects before purchasing. The size of the die grinder is dependent on the job you would like to do. If you are polishing a surface or working on a small project, you do not need a large size. However, if you are working in an industry or a construction site, using a ¼ inch die will be quite hectic. The powerful the motor is, the higher the performance of the die grinder will be. This is one of the most important aspects to consider because it controls the speed of the grinding wheel. A motor with a horsepower of 0.25 is good enough for your needs. Whether you decide to purchase a right-angled or a straight head grinder, it is all a matter of preference. Nonetheless, right-angled die grinders are more popular because of their comfortability and ability to reach tight spots. Also, such die grinders can easily be mounted with a grinding wheel. The three major power sources for die grinders are corded-electric, cordless and pneumatic. To make an informed decision on which one to buy depends on certain variables. The thing here is to carefully analyze what works for you. If you plan to purchase an air compressor or you already have one in your possession, the best thing to do is to have a pneumatic die grinder. This will go a long way. The thing with a cordless model is that the batteries do not last long per charge. This means that you always need to keep halting your job in order to charge the tool, then continue. This can be quite frustrating.On the other hand, with corded-electric models, you have to take into consideration comfortability and maneuverability. This can be hard to come by and if you get one, it may not be budget friendly. If you lean more towards cordless and corded-electric, then ignore this aspect. Nevertheless, if you are interested in a pneumatic die grinder, ensure that your air compressor can provide enough CFM (cubic feet per minute) at the right PSI (pounds per square inch). The amount of air forced through the tool is dependent on the speed and power behind the pneumatic air grinder. If your air compressor can work at the minimum volume and pressure, then you are good to go. In simple terms, this is a handheld power tool that is used for polishing, honing, sanding, grinding or machining materials. These materials can range from wood to plastic, as well as metal. With some die grinders, you are required to change the grinding wheels and use the wheel that is catered to the specific surface. The main purpose of a die grinder is to grind, polish or sand areas that are too tight or far to reach with other equipment such as the angle grinder. This powerful tool normally comes with a spindle spun either by air or electric power. What this spindle does is that it holds a collet for abrasive and polishing attachments, cutting wheels, bits and among others. There are two major types of die grinders: pneumatic and electrical. For household use, it is advisable to go for an electric die grinder. On the other hand, a pneumatic die grinder is best performance-wise. They can be used for a longer period of time, while still maintaining the low heat. This means it can be based used in an industrial setting. From the information above, it is evident to see that the best die grinder is one that fulfills its purpose and the craftsman’s’ needs efficiently. After carefully inspecting and introspecting, it is safe to say that the best die grinder is the Makita GD0601 1/4-Inch Die Grinder. This is because the manufacturers have come up with a state of the art invention that assures you of strength, power, and durability. Also, the company is known to make energy efficient and sustainable products so you do need to worry about the harmful exhaust gases and overheating. As compared to the other four reviewed, this powerful tool has an added feature of protective zigzag varnish and an AC/DC switch. Most importantly, it produces lower noise when in use. This ensures the craftsman is protected while using the tool and working efficiently. Q: What is a die grinder and what is its use? A: It is designed for honing, grinding, polishing, sanding as well as machining and it is typically used for metal and can also be used for other materials such as wood and plastic. It is ideally used by sheet metal workers, woodworkers, welders, engravers and jobs that require metal shaping. Q: What tips do I need in choosing the best die grinder? A: An air die grinder with ¼ inch shaft is great for power and efficiency. The higher its CFM or air consumption means more power is drawn. In fact, most shanks have a standard size of 1/4 inch and the smaller die grinder consumes at about 4 to 6 CFM while bigger ones for heavy duty work can consume about 10 CFM. In general, you should get an angle grinder that comes with a rear exhaust for convenience and cleanliness. Q: If I have an air compressor, which is the die grinder to use? A: An air compressor works best with a pneumatic die grinder. It is actually advisable to go for a pneumatic die grinder because the cordless type loses charge frequently and the corded electric is harder to maneuver and less comfortable. Also, Learn More How To Cut Pavers With An Angle Grinder Guide to Build Your Skills!